I was told that the best coffee I would ever have would be in Australia- and the best city to find it in was Melbourne. Now after being in the Australian city for a few weeks, I can vouch that it is true: Melburnians have a bit of a love affair with coffee. They love it so much in fact, that the city free walking tour even included a trip to a cafe for Flat Whites. Melbourne snobby love of a good cuppa is infamous, and Melbourne barista’s are actually sought after by cafes around the world. Melbourne is after all, the city that defied Starbucks, favouring independent cafes and brunch spots. Supposedly there’s not a bad cup of coffee to be found in the city and so far I’d have to agree with that. Considering that Australia is the birthplace of the Flat White and responsible for the well established latte art culture that we are all used to worldwide, I feel that I have to take what Melbourne’s coffee menus say as bible. However when I got here, the thing that surprised me most was just how big of a difference there is between the typical Australian versions of coffees and the ones I am used to in England. After working in a cafe here in Melbourne along with working my way through a lot of caffeine filled beverages in the city, I feel that I know a fair bit about Melbourne coffee culture. 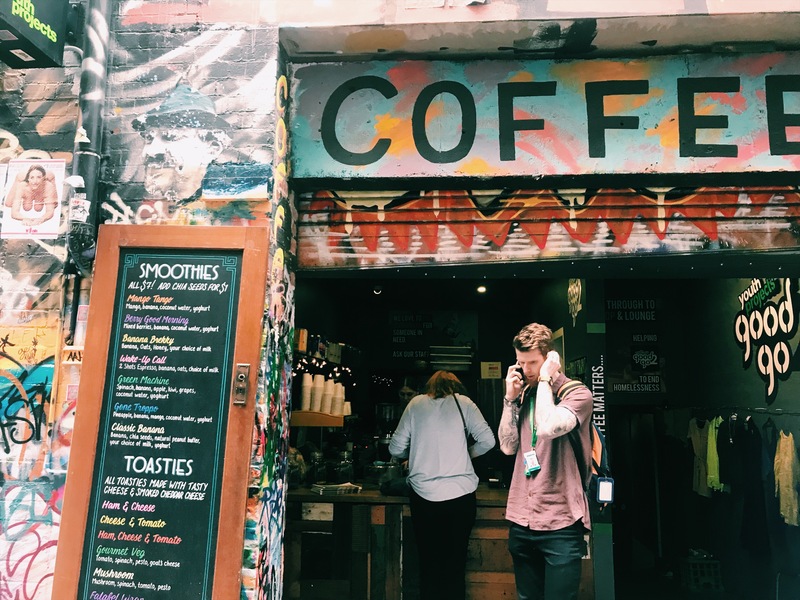 So, I thought that I would make this guide on the Australian coffee menu for all of the other confused coffee loving travellers out there- now you can order your morning pick me up without feeling like an outsider. The Flat White in Melbourne is like the tea to England so it’s always a safe bet if you don’t know what to order. In Melbourne, a Flat White is a little like a latte. It really comes down to the thickness of the froth- a true Flat White should consist of espresso with hot steamed milk and only a thin layer of micro foam. It is also usually served in a cup, not a glass like a latte. Unlike in the UK, a flat white in Melbourne isn’t necessarily a stronger drink and usually just comes with just a single shot unless specified that it’s wanted ‘strong’. Latte’s in Australia aren’t the soup bowl sized milky beverages that we are used to at home. A regular latte in Melbourne is fairly small in size, with a thin layer of froth that comes served in a tall glass. Cappuccino’s seem to be the same all over the world. In Melbourne cappuccino’s consist of one shot of coffee, foamy milk and chocolate powder, usually sprinkled on top of the espresso shot before the milk is added, for aesthetics. Americano lovers, this one is for you. Ask for an Americano in Australia and you’ll stick out like a sore thumb. Consisting of just coffee and water, the long black is your milk free coffee drink of choice. The main difference between the latter and an Americano is that the espresso is poured on top of the hot water, rather than first, as not to scorch the coffee, and it’s usually diluted with less water. It’s still acceptable to order milk at the side. Sorry to disappoint those visiting from the states, but filter coffee isn’t really a thing here. That’s an espresso to us Europeans. Simply a single or double Macchiato. A small amount of foamy milk is spooned on top of an espresso, usually served in a glass cup. No, I’m not talking about the drinking game. A piccolo or Cortado, as it known in Europe, comes down to the size of the glass. To make it, latte consistency milk is poured over an espresso served in a tiny glass- it’s just like a latte in minute form. Bullet Coffee is something that I expected to see more of on the menu in Oz but it’s not actually that common. What makes a bullet coffee unique is that it is made with butter. Sounds odd? Well actually once melted, the butter turns the coffee the same colour as milk would and the fat from the butter is supposed to keep you fuller of longer and give you tons of energy, hence the ‘bullet’ part. The humble chai latte is also a big thing in Melbourne. One of the more popular coffee alternatives, chai tea powder is mixed to a paste, topped with hot milk and finished with warming cinnamon powder. Hot chocolate in Melbourne is all about the athletics; expect beautiful latte art on top of your cocoa. Turmeric Lattes are something that have become quite popular in the UK too. To make them, a small amount of turmeric powder and usually something to sweeten it with, are mixed to a paste with water and then topped off with hot milk. The vivid yellow colour of this drink makes it appealing and it’s caffeine free meaning that it’s a good choice for the afternoon. Matcha Latte’s aren’t just popular in Melbourne’s Chinatown; you can usually order these green coloured drinks in the city’s more trendy cafes. Green tea matcha powder is mixed to a paste and topped off with hot steamed milk. The matcha powder is supposed to be high in antioxidants and has a smooth, strong taste. As usual, I hope that you guys enjoyed this post and found it useful. Does anything in this post surprise you or more importantly, do you disagree with anything that I’ve said? Let me know in the comments below. Similarly, if anyone has any cafe recommendations for Melbourne then I would love to hear about these too. You can read more about my travels in Australia here, or take a trip around the globe with me through my worldwide cafe reviews here.